220g-jar packaging of almond figs. Life-size almond figs (in conversion to organic farming). 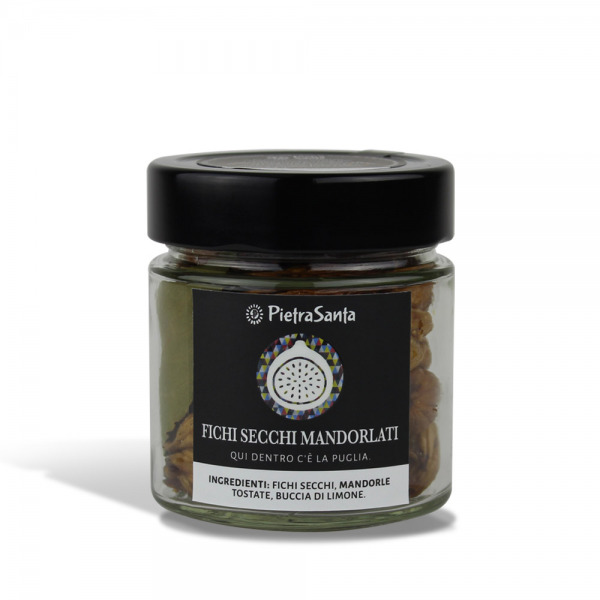 Ingredients: figs dried in the sun, lemon rind, roasted almonds, laurel. Do you like tasting figs? Here is the recipe for you: figs with almonds. You can enjoy them for breakfast or tasty snack, like the Apulian tradition recommends. The figs are harvested in August, cut and left in the sun to dry on special reed rack, called "littere", and when they reach the right degree of drying, they are stuffed with roasted almonds and lemon rind (all produces from local territory between Carovigno and Ostuni, in the heart of Salento). Once the jar is opened, keep the inside edge always clean after each use, keep it away from heat sources and protected from sunlight.